On October 29 we entered into an option trade on BABA weekly 80 calls, at the low of the day, which returned close to 100% profit the same day. Per our TradePlan we sold just over 1/2 of the position, and held some overnight. 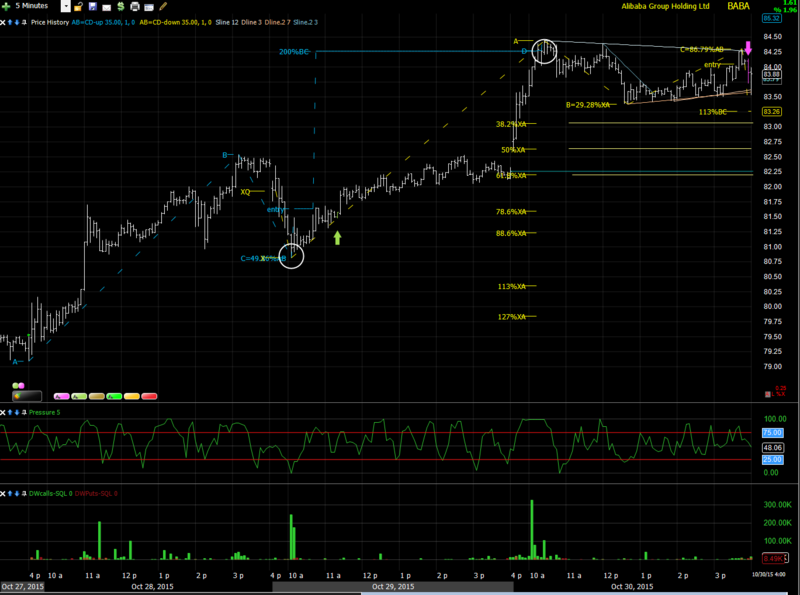 Reason for holding was that we had a clear objective of a overhead target in the form of an AB=CD PRZ on a 5min chart. By 10:30 on Friday October 30th, this objective was achieved and we alerted on twitter that we’d start selling at that point. This PRZ proofed to be the HOD. At that point again we saw some huge call buying activity, but these were next week’s expiration. there was no notable Put buying of any size. In the last 15 minutes BABA, traded below an entry for a possible CD leg lower. For next week, we’ll keep BABA on the radar for a reversal trade at a bullish PRZ, if it pulls back from these levels a bit. Unfortunately we have missed the huge move since the September lows and preferably I’d like to see it make a pullback into the high 70’s first. but we’ll see.